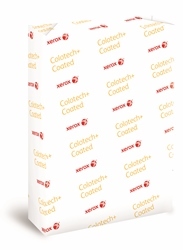 Xerox Colotech+ Gloss Coated paper is a double sided coated paper with an ultra smooth surface. The SRA3 sizes give guaranteed performance on digital colour printers. The high gloss finish and bright white shade gives enhanced image sharpness and colour brilliance to your printed documents. FSC Certified. Available in A4, A3 and SRA3 formats.